The benefits of a healthy diet are clear and well documented. In addition to providing the nutrients a growing body needs, consuming a balanced diet helps children maintain a healthy weight. Obesity continues to be a growing problem among school-aged children and can contribute to the onset of type 2 diabetes, heart disease, high cholesterol, and many other adverse medical conditions. Children attending school will eat at least one meal away from home each day. A healthy lunch provides sound nutrition to give students energy to do well in school and for the rest of the day. Children who do not eat well at lunch may have difficulty concentrating, while others may feel sluggish or tired. As part of the 2010 Healthy, Hunger-Free Kids Act, the United States National School Lunch Program was revised to guarantee healthy, nutritionally sound choices, as established by the U.S. Department of Agriculture, for lunch. America’s school menus were altered to be healthier than ever, including more fruits and vegetables while limiting calories. Despite some controversy through the years, including some students saying the smaller portions and food choices aren’t always satisfying, states suffering from high child obesity rates have seen marked improvements. Canada is one of the few leading industrialized countries that does not have a national nutrition strategy to implement healthy school lunches. It’s estimated that only 10 to 15 percent of Canadian children have access to school meals. These meals are not provided by a well-funded national program, but by a patchwork of individual volunteer efforts, some provincial government funding and corporate donations. Whether students purchase lunch from school or bring lunch from home, there are ways to guarantee a more diverse offering and better nutrition. Here are some guidelines to follow. * Offer nutrient-dense foods. Foods should contribute to the daily recommended amounts of protein, iron, calcium, vitamin A, and vitamin C. Provide a selection of foods, such as lean protein, whole grains, fruits, and vegetables, that will give children the nutrients they need. Nutrient-dense foods also help kids feel fuller, longer. * Limit fat intake. Avoid foods that do not get their fat from polyunsaturated and monounsaturated fats. Saturated fats can lead to obesity and clogged arteries. The American Heart Association recommends kids get no more than 25 to 35 percent of their calories from fat. Fish, nuts and olives are healthy fat sources. * Let kids choose some of their food. Allow kids to pick some of the healthy foods they will be eating. Giving kids a say in their diets will make them more likely to enjoy their lunches and cut back on snack foods. Eating meals regularly will keep energy levels up during school and make kids less likely to reach for unhealthy snacks to fill hunger gaps. * Make small changes that add up. Switching from white bread to whole grain breads, and opting for low-fat dairy products instead of full-fat dairy products can make a world of difference. Kids may not notice a change in texture or flavor, and many of kids’ favorite foods, such as chicken nuggets, pizza and macaroni and cheese, can be made with healthier ingredients. * Remember, beverages count, too. Giving children a healthy lunch and then packing a sugar-filled, high-calorie drink negates your efforts. Calories from beverages can quickly add up. Water is always the best option for a healthy drink. Low-fat milk and real fruit juice consumed in moderation also make healthy alternatives to sugary beverages. 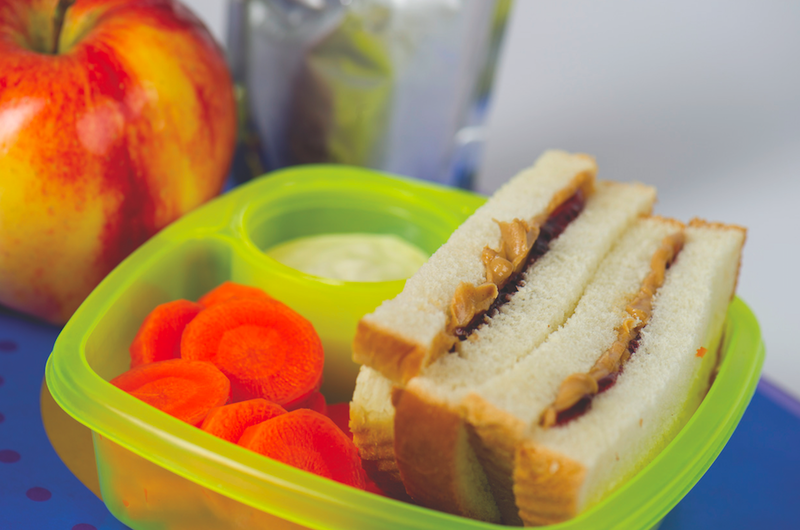 Offering healthy school lunches is an important step to raising healthy kids. New guidelines and offerings make it easier for kids to get the nutrition they need for their growing bodies.